The story. Jennifer Waits and Brian Mast, wife and husband and parents of a pre-teen daughter, live in San Francisco and have day jobs; she is an expert on college radio who writes and podcasts about radio culture; he in communications and public relations services to start-up tech companies. They appear in these pages because they also own and operate a boutique wine brand called Waits-Mast Family Cellars, which makes about 600 cases of mostly-vineyard-designated pinot noir annually. They deserve attention for this wine, which is very good indeed. 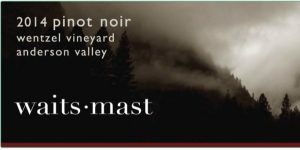 I discovered Waits-Mast at a trade tasting organized by the Anderson Valley Winegrowers late last year (November 2017) but was actually quite late to the train. The brand had attracted attention from alert observers of the California wine scene almost a decade earlier, appearing on the best-of lists promulgated by the San Francisco Chronicle, Wine Enthusiast, Wine & Spirits, and other publications. It can also be found on the shelves of a few enlightened retailers on both coasts, and on the lists of an impressive cohort of restaurants in California, New York, and Chicago. The Waits-Mast story began innocently enough soon after the couple met in 1998. Neither was a serious wine person then, but both enjoyed romantic getaway trips to the Mendocino Coast that traversed Anderson Valley. They visited tasting rooms, developed a taste for pinot noir, and became regulars at the Anderson Valley Pinot Noir Festival, held annually in May. Gradually their interest in wine deepened, and they imagined making some themselves. Enter Crushpad in 2004, a groundbreaking urban winery conveniently located about ten minutes’ drive from their home in San Francisco. Explicitly designed to give ordinary folks a chance to create wine projects of their own, each project executed with as much (or as little) professional support as the client might desire, Crushpad seemed tailor-made for a project of uncertain trajectory. In 2005, the couple made a single barrel of pinot (from the Amber Ridge Vineyard in Russian River Valley near Windsor) at Crushpad; a second barrel, from the Hein Vineyard in Anderson Valley, followed in 2006. Their first commercial release was one barrel of pinot from Anderson Valley’s Wentzel Vineyard (see below), and one from the La Encantada Vineuard in Sta Rita Hills, in 2007. Drawn to the Crushpad story in 2009, San Francisco Chronicle wine editor Jon Bonne happened on a bottle of Waits-Mast’s first commercial release. To the surprise of both principals, the wine figured in the newspaper’s 2009 Best Wines list a few months later. To say that the rest is history would be a gargantuan oversimplification. Only a few years after its ballyhooed opening, Crushpad moved its premises from San Francisco to Napa, then ceased operations entirely a year later, orphaning hundreds of projects. To preserve their brand, Waits and Mast applied for their own TTB permit. They also burnished their growing network of growers and fellow winemakers, negotiated their own contracts for grapes, used personal shoe leather and time squeezed from their day jobs to sell wine to Bay Area retailers and restaurants, piggy-backed out-of-area market development on travel related to their day jobs, changed winemakers as necessary, and relocated production twice. Today (February 2018), on the verge of bottling their tenth commercial vintage, the brand is critically successful and commercially stable, but still semi-itinerant. Production is currently done on a custom crush basis at Roar Wines in Dogpatch, not far from Crushpad’s old premises; the winemaker is Shalini Sekhar, a Cal State Fresno-trained enologist with prior experience at Rosenblum Cellars, Williams-Selyem and Copain Custom Crush. The portfolio consists of single-vineyard pinots from three Anderson Valley sites: the aforementioned Wentzel, Deer Meadows Vineyard above Boonville and Nash Mill, not far from Wentzel in the valley’s “deep end.” In addition, the brand works with two sites outside the valley but nearby: Mariah in the Mendocino Ridge AVA, southwest of Boonville, overlooking Point Arena; and Oppenlander near Comptche, a tiny unincorporated hamlet about 20 miles north-northwest of Philo. Notes on a tasting of several Waits-Mast wines are found at the end of this post. Mast explains that the brand strives for medium weight wines made from just-ripe fruit, modestly extracted, and not overtly fruit-forward. Whenever possible, they aim for finished alcohol at or below 14°. This last element is not always possible because Waits-Mast buys fruit in very small quantities, usually just two or three tons per site per year, and growers are not always in a position to pick exactly when Waits and Mast would prefer. They negotiate with growers and fellow fruit-clients to arrive as close as possible to their preferences, but in the end many forces are in play, not least weather, transportation and crew availability, so they adapt. The exception to this generalization is Wentzel, which has historically picked with a dedicated crew, giving the growers the flexibility to accommodate each client’s special preferences. In the cellar fermentation and élevage protocols favor the expression of individual terroirs. Whenever possible, fermentations are unyeasted, and all of them take place in small t-bins. Cooperage sources, the percentage of new oak, and time in barrel all vary by vineyard and vintage, but overall new oak is used sparingly, varying between 25 and 35 percent, so that it does not mark the wine obviously, and there is a preference overall for coopers that privilege elegance, like Sirugue and Remond. Wines spend eleven to sixteen months in barrel before being bottled without fining or filtration. Although “blending” decisions are made proactively, the quantities of each wine are so small (typically two to four barrels) that no barrel of wine from any Anderson Valley site has ever been declassified, although some barrels of Mariah and Oppenlander have been blended to make a Mendocino cuvée. Waits-Mast is an interesting case study among tiny boutique brands. Like most of the genre, it is minimally capitalized, propelled primarily by passion and hard work, dependent on a host of third parties, and managed in fragile symbioses with important personal realities like family and day-jobs. But it also seems unlike most in several key ways. First it has survived, and garnered recognition. Good luck deserves part of the credit for this, but so does the principals’ seriousness. They have been patient with a gently sloped learning curve. (“Wine is a business you don’t get very good at very fast,” the late Jack Davies of Schramsberg told me years ago.) Second, it has been impressively faithful to Wait’s and Mast’s personal tastes. From the beginning they have known quite clearly what kind and shape of pinots they liked; in conversations with prospective winemakers before their first wines were made, they were able to illustrate their stylistic preferences with examples. Mary Elke’s pinots from Donnelly Creek Vineyard were an early inspiration as were some bottlings of Londer. It may also have helped that Waits and Mast came to pinot without either inspiration or baggage from Burgundy, saving themselves and their winemakers from tilting at windmills. Finally, Waits and Mast still seem to like their day jobs. Even as they can imagine turning to wine as their principal business some day, they are content to learn, and grow, patiently. Meanwhile, twists and turns continue. Roar’s prospective move, later in 2018, to new premises outside San Francisco will necessitate another change of venue for Waits-Mast’s production. Nor will Deer Meadows’ fruit be available to Waits-Mast in 2018; Ted Lemon will keep all of it for his own brand, at least for the immediate future. Waits and Mast seem calm about these challenges, however. One has the impression that for them, and for the brand, the next year, and decade, are not likely to be any less interesting than the last. 2016 Anderson Valley Pinot Noir, Deer Meadows Vineyard. Owned for many years by Rich Savoy but recently sold to Ted Lemon of Littorai Wines, this site has proven its unique character both before and after a 2001 replanting, not least to Lemon, whose One Acre bottling was (and now is again) sourced from it. In Waits-Mast hands, it is also impressive. Tasted from tank, the 2016 Waits-Mast was a very transparent dark ruby red wine with a keen balance among fruit, earth and exotic south Asian spice. 2013 Anderson Valley Pinot Noir, Deer Meadows Vineyard. A perfect example of what a few years of bottle age can do for wines from vineyards that tend toward understatement when the wines are young. The 2013 was alive with intoxicating perfume. Decidedly floral now, but still marked with the site’s signature of south Asian spice, it was also a tad weightier at mid-palate than the 2016. This was (and is) an elegant and genuinely beautiful wine. 2014 Anderson Valley Pinot Noir Wentzel Vineyard. More spicy than the Deer Meadows, and spicier in a southeast-Asian way. Some of the impression of spice is owed to the inclusion of whole clusters in the fermentation. More obviously fruity too: bright with cranberry, raspberry and strawberry; all three lifted with acid. A very attractive wine. 2015 Anderson Valley Pinot Noir Nash Mill Vineyard. Burlier, rounder and larger-framed than either of Deer Meadows and Wentzel, despite a deceptively bright, pale robe. Higher alcohol here, and more black fruit than red, both probably driven by later picking than the ideal Waits-Mast style should demand, especially when one considers that the site is actually cool compared to both Deer Meadows and Wentzel. 2016 Mendocino Ridge Pinot Noir Mariah Vineyard. This tank sample was a dark and earthy wine touched with aromatics that evoked redwood trees, wet bark, moss and mocha. The site was new to me in this tasting, and was unarguably distinctive, giving mossy, deeply-flavored wines that are brawny, round at mid-palate and mouth-filling.